You know that the Democratic National Convention is being held in Charlotte, N.C., the hometown of Billy Graham and site of The Billy Graham Library. We also recently profiled the Crusades that took place in Charlotte throughout the years. But, what about Tampa, the site of the Republican National Convention, which begins this week? Billy Graham has strong ties and connections to that city as well. 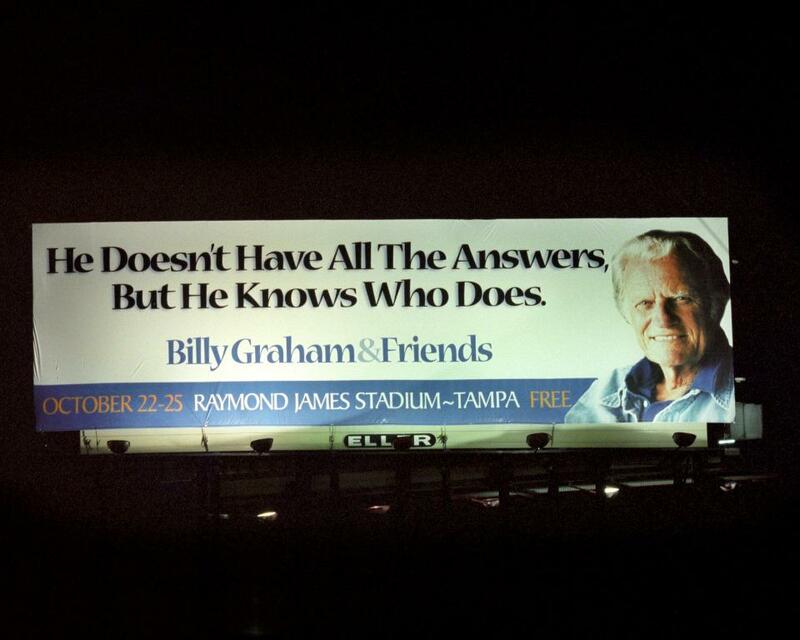 You could say that Billy Graham’s ministry began in Tampa. That’s where he attended Florida Bible Institute in Temple Terrace, 15 miles east of the city, from 1937 to 1940. His first preaching opportunities came at small churches and street corners in the Tampa area during his time at Florida Bible Institute. And, it was during his time at Florida Bible Institute that he received the call and fully committed his life to proclaiming the Gospel. Billy Graham returned to Tampa in February of 1961, as the team embarked on a multi-city Florida Crusade. Other stops included Orlando, Jacksonville, St. Petersburg, Bradenton, Sarasota, Clearwater and Tallahassee. Meanwhile, other members of the team were holding events in other cities throughout the state. During the stop in Tampa, 20,000 attended and more than 600 made decisions for Christ. It all came to fruition March 21-25 at Tampa Stadium. More than 175,000 attended and 6,000+ made decisions for Christ. 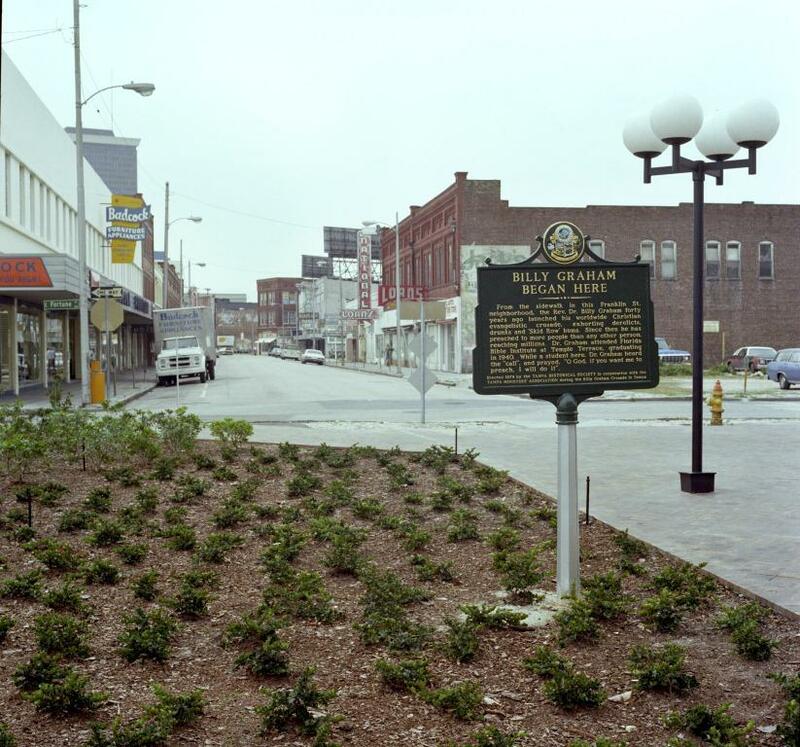 During the Crusade, the marker seen above was unveiled, paying tribute to Billy Graham’s beginnings on the streets of Tampa. Billy Graham’s third Tampa Crusade in October of 1998 broke two consecutive attendance records for any local sports facility, and it was the first non-football event to be held in the newly constructed Raymond James Stadium. Audiences averaging 64,500 filled the stadium, of which an average of nearly 4,900 each night came forward to make a commitment to Christ. Tony Dungy, then coach of the Tampa Bay Buccaneers, had the opportunity to introduce Billy Graham at the Crusade. He shares about that experience here. RIP Mr. Graham (02-21-18) I was blessed with the opportunity to attend this Crusade in Tampa. We were there the evening Michael W. Smith sang my wife’s and my wedding song, “Friends.” (kind of bummed he commented that “If I knew I was going to play this song 10 million times, I probably wouldn’t have written it!” – That certainly could have been left out of his intro. Regardless, the evening was magical – especially watching so many answer the call at the end! I still have a bumper sticker from this event. Thank you, Mr. Graham for your lifetime of devotion – May the Good Lord Receive you into His Kingdom and I pray Heaven is everything you had hoped it would be!!! Thank God for Mr. Graham. I made my profession of faith in Christ at his crusade in Tampa in 1961. I didn’t meet him at the crusade but I sure look forward to meeting in the future. I was to attend this crusade in 1998..but my daughter went into labor with my grandson in the women’s hospital just a few blocks away. Jared David was born after our prayers were answered due to a hard labor about the hours that Billy delivered the alter call. Our dear Jared needs prayer today because of autism (lower type on scale) that deals with communication. I worked one of the Tampa crusades in Tampa years before. And I don’t remember a time that my mom, grandmother and aunts didn’t call everyone around the TV to hear Billy teach the Gospel for years. God bless his family and friends that worked with him. As a teenager in Tampa, late 40’s or early 50’s I sang in the choir as it seemed a couple was sent from several churches in the local area to help make up a large choir, at the Billy Graham Revival/Crusade, I have a clear memory but can not find anything on it. Can you help?? Billy Graham did a Youth For Christ rally in Tampa in 1946. I believe this must have been what you were referring to. We would suggest contacting Youth For Christ for more information.